Nineteen of those were shot this past Saturday, including a 12-year-old boy. My second thought: Why isn’t Alyssa Milano marching for more #GunControlNow in Chiraq? From Yahoo: The city of Chicago had seen a large reduction in murders and shootings for the first four months of 2018, but as temperatures have increased, so has crime. The Chicago Police Department recorded that at least 74 people were shot in the country’s third-largest city, with 28 of those shootings occurring between Friday evening and Sunday morning. Two men in their 20s were shot outside an East Garfield Park building just hours after two other people were shot on the exact same block Sunday, the Chicago Sun-Times reported. Police had previously been hopeful that gun violence was on a downward trend after seeing more than 1,400 total homicides between 2016 and 2017. The city’s shooting victims are predominately on the city’s south and west sides. Two men were killed and at least 16 people were wounded in shootings on Saturday alone. Two women were shot outside of Mount Sinai Hospital while waiting for news on the condition of a relative shot earlier that morning. While police have noted that many of the dozens of shootings this week appear to be gang-related, the majority of victims are under 30 including several teenagers and a 12-year-old boy on the city’s Westside. Additionally, a 4-year-old girl was shot in the shoulder Tuesday as she sat with her parents on the family’s South Side porch. A 15-year-old boy was struck in the head by a bullet Wednesday afternoon as he rode a city bus home from school. The boy is listed in stable condition and police told USA Today they believe he was was not targeted, but instead was hit by errant gunfire. Um, you have PLENTY of “common sense” gun legislation in Illinois…CRIMINALS DON’T FOLLOW THE LAWS! Compared to 2017, Chicago saw a 22.3 percent reduction in murders and a 26.5 percent decrease in shooting incidents from January 1 through the end of April, according to data collected by the city and the University of Chicago Crime Lab. April was the 14th consecutive month in which the city saw a year-over-year decline in gun violence incidents, police spokesman Anthony Guglielmi told reporters. Chicago recorded 721 people being shot in 2018 through April 29, which was 319 fewer than 2017. But homicides and gun violence historically peak in summer, warmer months. April was the fourth-coldest on record this year but rising temperatures over the past week were reflected in the spike in gun violence. In 2017, there were 1,040 shootings across the city of Chicago and 2016 saw the most shootings of the past seven years with 1,115 recorded shooting victims. 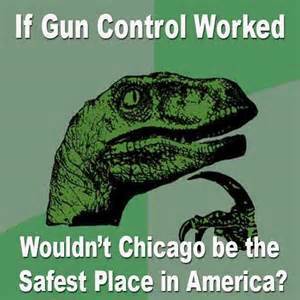 This entry was posted in Children, crime, gun control, Liberals/Democrats/Left, Taxes, United States and tagged #2A, Chicago, Chicago Police, Chicago's gang violence, Chicago's gun violence, Chiraq, Rahm Emanuel. Bookmark the permalink. I’ve long had a small piece of skepticism concerning these Chicago crime figures.